In case you missed it, false teeth have been in the news twice lately. The first story comes from York Towne, DE, where Robert Henry Stahl, 62, is charged with stealing a man's false teeth right out of his head. It seems Mr. Stahl met Billie Townsend, 56, at a bar. Mr. Townsend owed Mr. Stahl some money and didn't want to pay. So, outside the bar, Stahl got Townsend in a headlock and took his false teeth. He is quoted as saying "You ain't getting these back." He was true to his word. Mr. Stahl kept the teeth and now has been charged with robbery and battery. He could face up to eight years in prison. 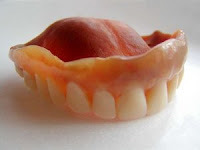 The second false teeth story comes from Wellington, New Zeland where an unnamed patient lost his false teeth during surgery. Fortunately, they found the teeth four days later. Unfortunately, they found them in his throat. The man complained about extreme pain in his throat following surgery. Nurses noticed that his voice was "husky" and he couldn't eat much. Using a laryngoscope, doctors found the problem... and removed his upper plate from his throat.